The Crossroads is a room inside of the Secret Mine in the game Luigi's Mansion: Dark Moon. The Crossroads is accessed by taking the left door inside of the Airway. The Crossroads is a small room separated by a large gap. 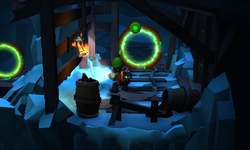 The two sections of the rooms are connected by E-Gates which Professor E. Gadd had previously placed during his time inside of the mine. There is a minecart on the left side of the room and a lantern on the right side. The door to the right leads back to the Airway and the door on the left leads to the Skip Slope. During D-2: Hit Rock Bottom, Luigi must go into the Crossroads to reach the Crystal Quarry in the basement. However, when he gets there, the door to the Skip Slope is locked. Nearby is a key frozen in a block of ice. Luigi must go through the E-Gate to get the key inside of the minecart. He must bring the key to the lantern to melt the ice around it. After this, Luigi can go through the door. Only during D-3: Across the Chasm and D-Bonus: Severe Infestation, the minecart that originally had the key in it in B-2: Hit Rock Bottom is now missing. If Luigi reveals the minecart with the Dark-Light Device, the Spirit Balls fly to the other side of the Crossroads. After Luigi captures the Spirit Balls, a sapphire pops out of the minecart. This page was last edited on May 1, 2017, at 21:28.